They approach me en masse—blonde, under four feet tall, each carrying a stuffed animal bound by leash. They are so close, their shoulders touch. They may as well be linking arms, but they aren’t. I sit on a bench in Memorial Park in Clarkson, Nebraska in front of the memorial—a grey pyramid of rough-cut stone set on a dais surrounded by big trees. “Hi,” I say, as they stare. One chews her lip. One clutches a tiger, another a lion, the third pulls her long braid. “How are you?” I ask, unsure how to speak to these four little girls. Before dinner in the Opera House, I’d come here to snack, waiting for the local high school dance squad to shake silver pom-poms to remixes of “Jessie’s Girl” in the afternoon light. After the buffet of sausage subs with sauerkraut, dumplings, and strudel, I’d returned to await music, first the pom-poms, and later a polka band, much as I’d come to await any such riches. Within minutes the girls appeared, specter like, something akin to a vision glimmering in summer’s golds. Three were six, one was four, two were twins, two pairs were sisters. For an hour, they flung their stuffies into branches, sometimes letting the leash wrap around the bark and limbs. They climbed a cannon. They drew pictures. They told me they were all Czech, though could not speak the language and on Czech Days they danced and danced. One of their brothers arrived and one of their sisters. Twice one of their fathers stood on a porch calling out minutes left until dinner, the sound of his voice carrying from their lawn, across the park, to where I sat with four girls sitting beside me or pretending to climb trees, eating the snacks from my saddle bag or gesturing as they recounted how they decorated their bikes and made signs that said “Go, bikers, go!” to greet The Seven Cities Century riders when we arrived in town for the night. I was one of the riders, even if I didn’t fully know why I’d signed up, why I’d begun long-distance cycling for fun, what cycling gives me beyond fitness and health. I’m searching and I’ve found that when I bike for many miles, sometimes after hours studying the land moving around me, I arrive somewhere that is less physical and more mental, a place reachable only by bike. Now, I field their questions, as if they are oracles or fates measuring which of strings to cut and which to leave long and tensile strong. Or maybe they’re Czech maidens of myth who compel some to swallow what’s laced by something sleep-inducing. I am tried. I’ve biked seventy miles, but they’re just girls in a park in Nebraska. “Are you having a sleepover at the high school?” one asks, one of the twins with freckles across her nose. I scan the area—houses, a sweet shop with outdoor tables, old brick businesses, the backside of the Opera House where most of my fellow riders eat, awaiting the band. I look towards the street, unsure of the high school’s location, knowing only that I wasn’t part of a sleepover, even if I’d been on other rides where such high schools opened their doors to cyclists. So I had, erecting the dome and unzipping the windows, letting the wind swirl over my sleeping mat. I didn’t know what was to come, much as I still hardly felt like I knew where I lived. I was a born and raised Midwesterner, had traveled elsewhere to know differences, and yet, even if I’d lived in Nebraska for a decade, I still felt strange by its strangeness. Tent up, I showered. I ate among others in a room scented by sauerkraut. I sat in the park with the pyramid and spectral girls. I watched the dancers. I watched the band. I refound my tent, chanting silently in my head to better remember the towns I’d visited during the day—Norfolk, Stanton, Pilger, Wisner, Howells—the towns I’d pedal through tomorrow—Madison, Enola, Norfolk—and the town where I was to sleep—Clarkson. All day and last night, I’d feasted on food spread out—spaghetti and bread sticks, pork loin sandwiches and potato chips, orange wedges and piles of bananas, granola bars, and bagels, big pots of coffee. I felt good, strong, powerful, even if the backs of my thighs ached from the climbs, ones another cyclist quipped, “I’ve never seen so many 6% hills.” I felt hungry, even if I was full. I was intrigued about a town where children dance and dance, of a world with so much sauerkraut, of growing up among dads who play polka. Hills made good work of the body, made it warm and loose and comforted, as if pressing and lifting pedals for hours was an accomplishment provable in one day. I zipped up my tent, still unsure of the high school’s location and the sleepover in which the girls insisted I belonged, and fell into sleep so rich and deep, one would think I wasn’t lying on mat in a tent. I can’t see beyond the shoulder, not in front or behind. Sometime after eight, I hear the first robin crowing to the sun, a yellow dot to my right that disappears, and with it, the sound of birds. I pass three fresh roadkill coyotes, likely taken out by fog and cars and the way sound vanishes in this space. I approach an intersection and turn slowly, knowing somewhere ahead is the second SAG, only when I bike to the SAG sign, no tent of water and snacks emerges from the mists. I bike on, practicing not seeing, or rather trying to see with my peripheral vision, some mental exercise to see what wants to emerge and stop straining to see what isn’t there—cyclists, activity, anyone else on this ride but I.
I feel myself start to unhinge, some combination of miles biked and miles to go, the physical work of cycling, to visiting and being visited by strangeness in parks, to searching for something, as I’ve always been searching, when I moved from the Sonora Desert back to the Midwest, as if the land of saguaros, though beautifully majestic, was not quite the golden splendor of fields of corn spreading across the land, not the shimmering awe of the braids of Platte River, not the wide open spaces that stretch and stretch, letting one see for miles. I was searching for what made me feel good. Biking made me feel good. I was learning this, even if right now, I couldn’t see ten feet ahead of me. I’m thirsty, hungry. I stop to drink, call out, “Stopping,” to no one, slow and then feel that shift of momentum that means I’m going down. I’m moving too fast to think. I note facts—empty road, shoulder of gravel, both clips refusing to release. The pavement comes up quick and I hit, hard. My knee slams into the ground. My legs tangle, colliding with the frame. I’m half on the road, half on the shoulder. Without thinking, I drag my bike with me, pulling it from the road by my shoes, lest some ghostly beast emerge, made of engine and gas, and half-blind as I. I torque hard to remove the clips. “I’m okay,” I say aloud, to the specters, to the fates who’ve lifted the scissors to nick the string, but not cut it, not yet. My knee bleeds, oozing over fresh road rash. Mud streaks across my knickers and grit lines the crevices of my shoes. I curse, a lot. With a rock, I work debris wedged under the clips, feeling lost in the ethers. I stand and refuel to steady my nerves, that spook I feel inside this silence. I unfold the route map, as if the act of holding it will let me see. I think its ten more miles to the next town, Madison, but it might be more. I remount. I have no choice. She asks if I need anything, if I’m good and suddenly, I realize, beyond the road rash, I am. “I’m good,” I say, nodding her farewell into the mists that envelops her truck, but to a lesser degree. I listen to the music of her engine, letting it guide me down the road, into a fog that lifts and lifts until it’s gone. In town, I explore a museum with trains and local history, including a display on the orphan trains that arrived at last century’s turn. Greeters offer free bananas, cookies, and iced tea, and I eat and drink from them, sustenance that taste like honey. Tea has never tasted so good, not fruit, as if with the lift of the mists was the lift of some veil that had prevented me from knowing such sweetness, as if I’d failed for years to notice what goodness was right here. “Thank you,” I tell each of them. “You need one more letter,” I say, nodding toward her stick figure on wheels with a round handlebar, a person who seems to be made of a long dress and lots of toes. She looks at me and then at the paper, taps the paper with the pen, as if she needs a little more help in identifying what the missing letter might be and where it might go. “Bike is spelled with an e on the end,” I say, and point to where it belongs. She completes the word, shows it to me, and I compliment her, and we go on like this, drawing and describing, flinging stuffies into the trees and practicing what I call their “mad climbing skills” as they haul themselves up a monument of cannons. Around us burbles the talk of cyclists at tables eating ice cream and pie and cyclists walking in groups to wherever cyclist go post-feed—to town gathering places, to tents, to laughter among folding chairs, to more good food and then, a little more. The elder sister, a middle-schooler, appears and disappears, sits among us to tease her siblings, leaves and sits again, eyeing me, as if I might be more vagabond that woman, more in disguise than fellow Nebraskan, like some Odysseus cloaked in mists by a god. She rides up on a scooter as one of the twins spin dervishes under the trees holding a twig with drying leaves. “Come here,” she calls, pushing the scooter over to a bed of perennials, “This leaf is bigger than your head.” The girl runs over and she presses her head against the leaf to show her the difference in size. The girl squeals in delight, escaping from her sister’s hand as the big sister trots off, cat-like. “Hosta,” she repeats, nodding slowly, like the young botanist she might become. Her sisters repeat the word like a chant, lingering on the rumbling rattle of the word. 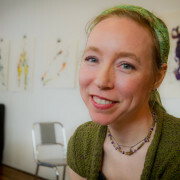 Laura Madeline Wiseman is the author of Drink (BlazeVOX Books), Wake (Aldrich Press), and The Bottle Opener (Red Dashboard). She teaches in Nebraska. Her collaborative book Intimates and Fools (Les Femmes Folles) with artist Sally Deskins, is an Honor Book for the 2015 Nebraska Book Award.